There is nothing as good and sweet as vermicilli payasam. 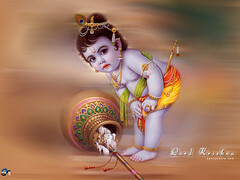 Nice pitures Bharathy! 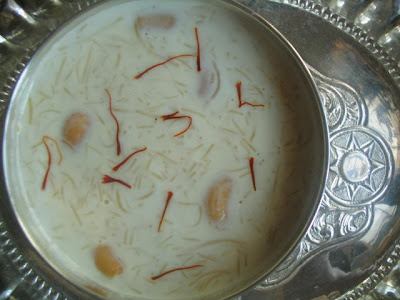 Semiya payasam, can never go wrong with this one :) looks beautiful! Semiya payasam tastes great with saffron. Nice payasam. Thanks for sharing. hi mouth watering payasam ...i love it..
nice presentation, bharathy! the pre roasted sevai works so well. semiya payasam always simple and tastiest. i prefer this to all those brown payasams we keralites have. btw did you take off 'others' option in comments? payasam looks Nice..your presentation is excellent. 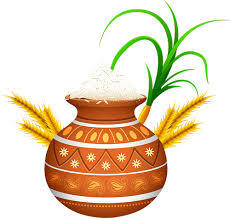 Haaaaaaaai Payasam..njan oru payasa kodichiyanne..evide kandallum kamannu veezhum..evideyum..
that one can never get old!! nice pic. Bharathy, I don't like sweets..but I prepare paayasam for my kids..evide visit cheyyunnathinu munpe ente mon paranju naale paayasam venam..! angottu paranju vidatte? 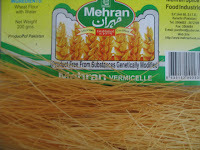 hey I have seen this semiya in Indian stores... it looks very thin. I havent tried with this , but for a long time wanted to. Next time I will surely try with this semiya. thanks. 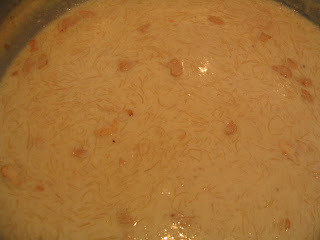 Payasam looks YUMMY!....it is very nice...love it. Beautiful presentation. I always make only pal payasam as it's my first fav. 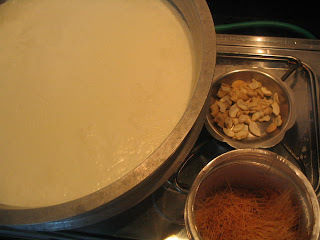 My hubby loves this payasam but I never tried this 'coz I was afraid if I would go wrong. Your instructions are very clear.I don't think I can make a mistake in this. will try it soon. Thanks. are you on a break? 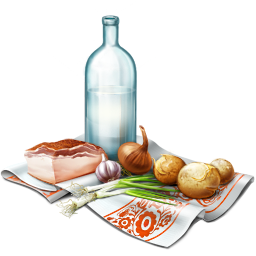 I came across your blog while I was on Saffron Hut blog. You guys are doing a wonderful job of taking great snaps of the yummmy food. i am new to blogging. Thanks for sharing all those recipes. 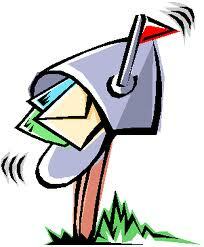 Saffron Hut has been out of the blogosphere since Jan 07 I hope all is well with her and her family. I miss her blogs she has such a wonderful skill of writing blogs and so do you. And to you too Archana,menu today,Shanti and asha..
Oh yes,Deepa Richa and Reena.. Thanks to your prompt visits, prema,sukanya ,kanchana,Dilip and Sia!! Yes Krubha,I hope semia payasam is one of the easiest,do let me know how it comes out for you..
Sharmi you are BRILLIANT...the one who had sensed a fellow blogger's break very well..YES!Right guess! I was on a holiday,Sharmi:)..
knock knock!!! where r u girl?